The Dakota Access oil pipeline, which winds hundreds of miles from the oil fields of North Dakota to a pipeline hub in southern Illinois is almost entirely built — except for a section under Lake Oahe, a Missouri River reservoir just south of Bismarck, N.D.
Members of the Standing Rock Sioux Tribe and a coalition of other groups have camped out since April near the site of the river crossing in an effort to stop pipeline construction. MPR News with Tom Weber devoted Tuesday's show to exploring the dispute in North Dakota over the proposed pipeline, with new reporting, updates and reflections from some of the key players in the story. History | Where it stands | Protesters | Law enforcement | The Standing Rock Sioux | The oil industry | Treaty rights | Racial tensions | What's next? To listen to the full hour, click on the audio player above. 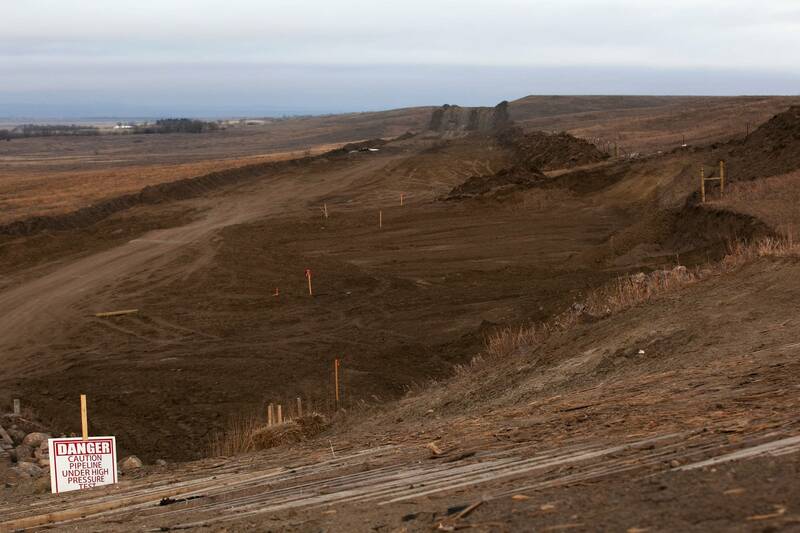 Energy Transfer Partners applied for state permits for the Dakota Access pipeline almost exactly two years ago. But even before that — in September 2014 — company officials were presenting their plan to the tribe that would eventually become its biggest obstacle. Protecting water has been the Standing Rock Sioux tribe's first priority, but the fight is also about asserting tribal sovereignty and protecting sacred sites within its historic territory. "We're fighting for water. And that's been our focus from Day One," said Chairman Dave Archambault. Public hearings were well-attended but relatively low-key. Company officials described the project in dry terms and citizens offered feedback. Some were supportive of the jobs the pipeline might bring. Others were concerned about reclamation and access to their farmland. When North Dakota's Public Service Commission approved the project in January, chair Julie Fedorchak said the project would be "extremely important to the long-term future of North Dakota's oil industry." But even with the state approval in hand, the pipeline still needed permission from the Army Corps of Engineers to cross several bodies of water, including Lake Oahe, which sits just a half-mile north of the Standing Rock Sioux Reservation. 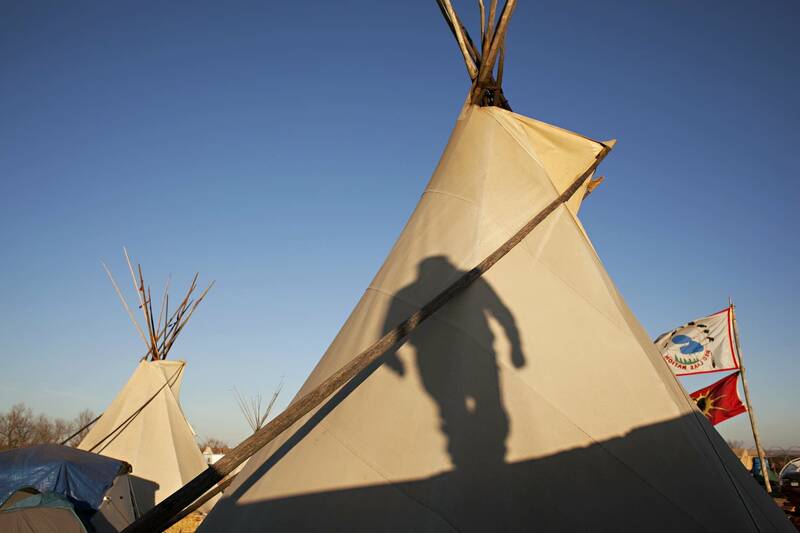 By July, the Corps issued its permits, saying in a 1,200-page report that the pipeline would have no significant impact on the tribe's drinking-water source or on its hunting and fishing treaty rights. Only a final easement was left. The on-the-ground protest grew quickly. 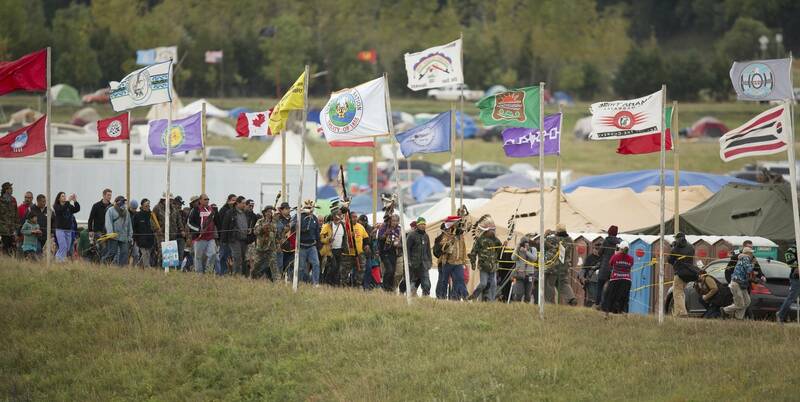 By September, thousands of people were camping near the pipeline site. To date, more than 570 people have been arrested. Dozens were injured in clashes with police. A class-action lawsuit claims police violated the civil rights of protesters. 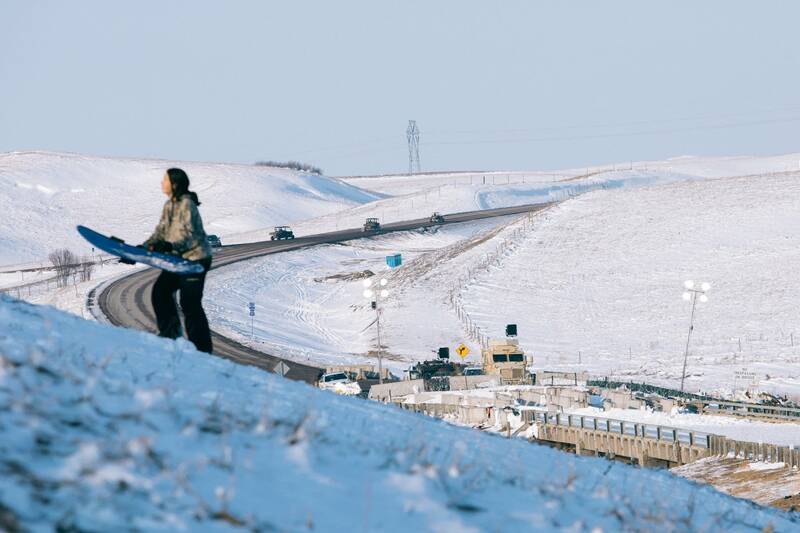 By November, the protest camp was preparing for winter on the North Dakota prairie. Energy Transfer Partners was still waiting on a final easement from the Army Corps of Engineers that would allow it to drill under Lake Oahe and complete the pipeline. Then President Obama threw the company a curve ball, saying the Corps was looking at alternative routes. Just a few weeks ago, the Corps denied that final easement, saying the project needed more study. The tribe marked the Army Corps of Engineers' announcement as a victory, and asked protesters to go home and be with their families over the holidays. But the dispute is far from over: Several lawsuits remain. A new president is about to take office. And there are questions about whether the company will just keep drilling so they can satisfy their investors' and customers' expectations that the pipeline would be online by Jan. 1, 2017. MPR News host Tom Weber spoke with Inside Energy reporter Amy Sisk, who's based in Bismarck, N.D., about where it all stands. Sisk has visited the camp nearly a dozen times, and was there just yesterday. She said that, since the Army Corps' announcement, a sense of calm has taken hold of the place. 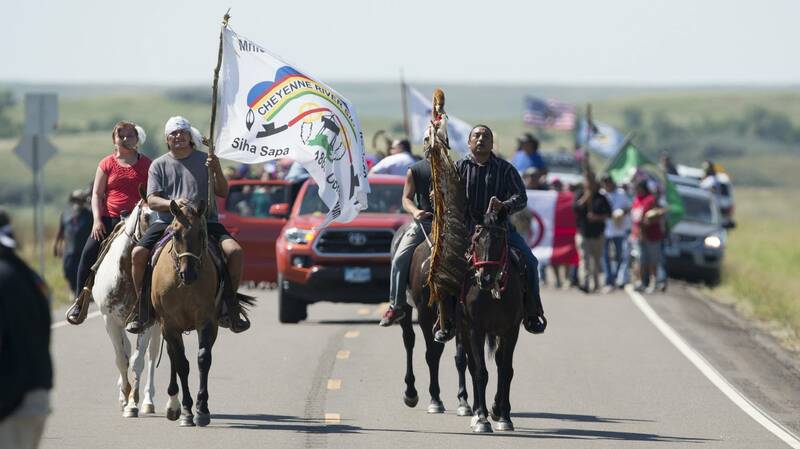 While many protesters have left in the past few weeks, she said, a few hundred remain, and are settling in to ride out the North Dakota winter. — Tom Weber with Prairie Public's Inside Energy reporter Amy Sisk | Bismarck, N.D. When members of the Standing Rock Sioux Tribe started a prayer camp at the confluence of the Missouri and Cannonball rivers back in April, they did not expect an international movement to spring up. By early fall, Tribal Chairman Dave Archambault stood on a hill overlooking the camp, made up of several thousand people from across the country, and tried to explain the rapidly growing movement. "There's a spirit rising across this nation, across this world saying enough is enough," he said. "I'm not the one doing all of this. It's beyond people. It's the Creator who's taking over." MPR News reporter Dan Gunderson recorded that interview back in September. He's been to the Oceti Sakowin camp several times — and he joined MPR News host Tom Weber to talk about the coalition that has come together around the Dakota Access pipeline protest: Native American groups, environmental groups, religious groups and others. They formed what one activist has called the biggest social movement in North Dakota in 100 years, since farmers rose up against the Minneapolis grain milling industry and railroads. Will this coalition hold together? The political climate and support for this movement will change with the incoming Trump Administration. What happens next? — MPR News reporter Dan Gunderson | Moorhead, Minn. Despite the harsh winter, people opposed to the Dakota Access pipeline remain camped out on federal land along the Missouri River south of Bismarck, N.D.
Police have stopped manning a roadblock near the camp. Authorities have said that's part of a good-faith effort to de-escalate tensions. But as MPR News reporter Matt Sepic reports, law enforcement is still facing intense criticism — including a class-action lawsuit — after a number of protesters were injured during earlier confrontations. 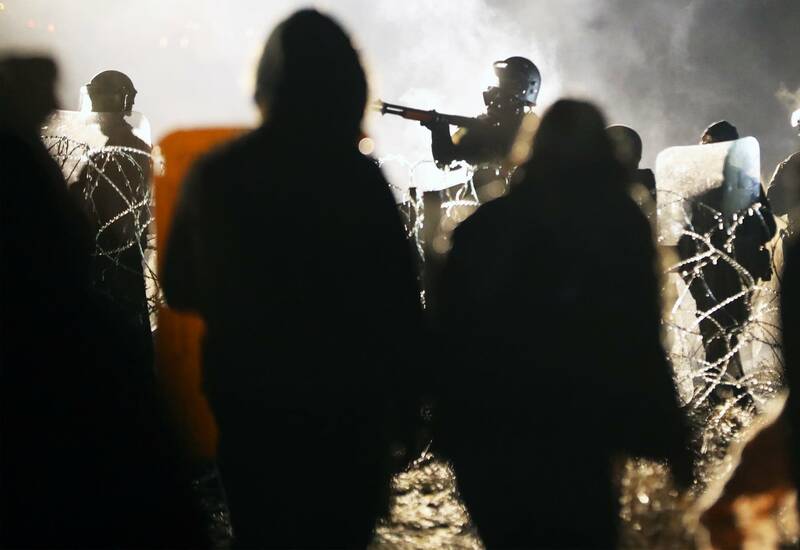 Law enforcement leaders say officers have shown restraint in the face of violence, but many self-described "water protectors" say they think the police are over-militarized. The Dakota Access pipeline protest raised tensions between Native American and white communities. Some say it's brought long-simmering racism boiling to the surface. A local priest said the pipeline protest is rekindling anger that dates to the defeat of Custer and beyond. 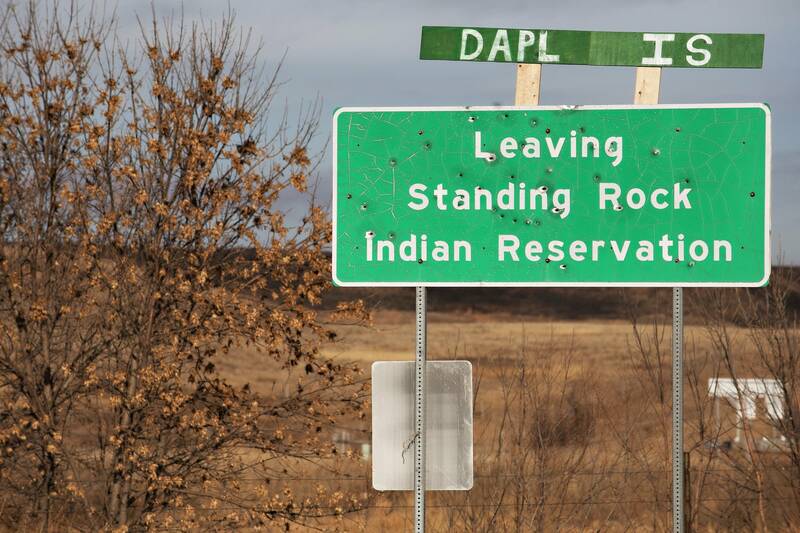 MPR News reporters Dan Gunderson and Doualy Xaykaothao spent time at Standing Rock and in communities near the reservation to talk with people about the future of race relations. Gunderson spent a practice with Solen High School girls basketball team. The high schoolers talked about watching history unfold in their own backyard — and about feeling the immediate backlash within the community beyond. Xaykaothao spent an afternoon on Main Street in the city of Mandan, N.D., just north of the Standing Rock reservation. She encountered people who were frustrated by the protests, people who couldn't understand their motives, and one man who empathized with their concerns about water. But nearly everyone she spoke with wanted the protest to be over — and the influx of visitors to their area to leave. — MPR News reporters Dan Gunderson | Standing Rock Sioux Reservation and Doualy Xaykaothao | Mandan, N.D. 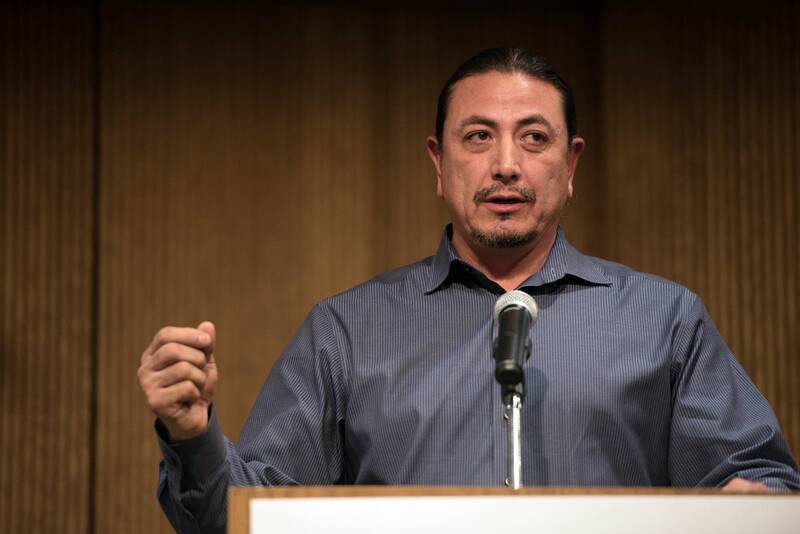 Standing Rock Chairman: Water "encompasses life"
"It's important to really understand what the tribe is standing up for, and what it means to not just the Standing Rock Sioux tribe, but to other tribes as well," Standing Rock Chairman Dave Archambault told MPR News host Tom Weber. His tribe's primary concern, Archambault said — amid its culture, its heritage, its language — is water. And that concern has spoken to other groups, too. "When we focus on that water, it encompasses life," he said. "So we have made a stance. And when we made that stance, it also drew a lot of other tribes and other organizations... In doing this, what we realized is that, for tribal nations within the United States, we have every right to stand up and protect what little we have left." Ron Ness, president of the North Dakota Petroleum Council, joined host Tom Weber to share his industry's take on the pipeline and the protests surrounding it. The Dakota Access pipeline, Ness said, "is really the interstate highway of Bakken crude oil to quality markets in the most reliable, safest manner possible." The question of whose land this is rests uncomfortably at the heart of the standoff at Standing Rock. The pipeline is being built mostly across private land. It crosses federal land where Energy Transfer Partners hopes to tunnel under the Missouri River. 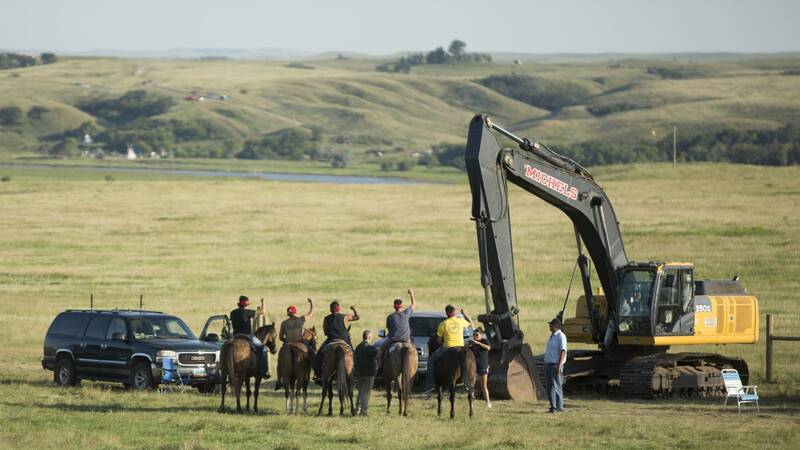 But the pipeline also traverses land that was once reserved for the Great Sioux Nation in an 1851 treaty. "This is Dakota territory. This is treaty territory. 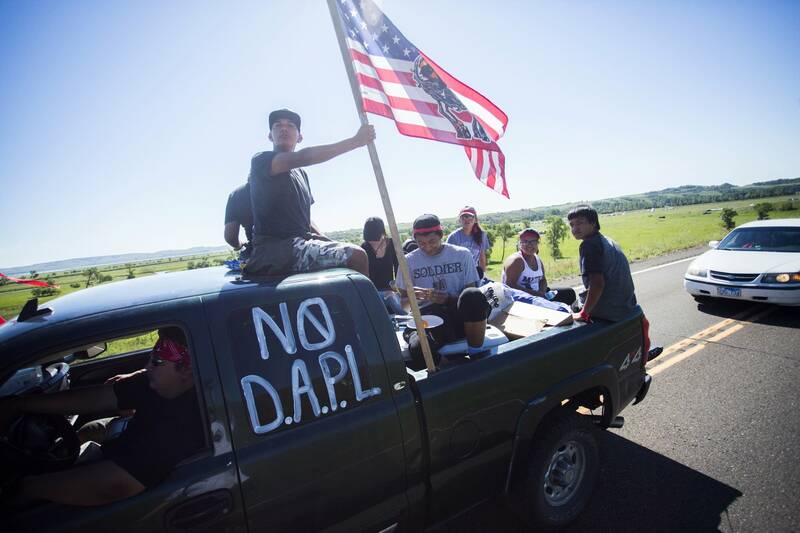 And no one has jurisdiction here except for our people," said Standing Rock tribal elder Phyllis Young. 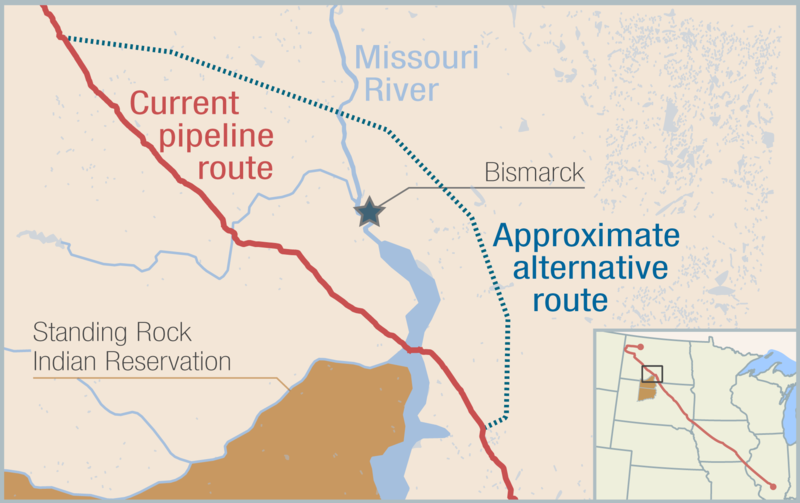 At its closest point, the pipeline travels about 2,500 feet to the north of the Standing Rock Indian reservation — less than a half-mile away. But while it doesn't cross within the current boundaries of the Standing Rock reservation, it does cross the ancestral land of the Standing Rock people. MPR News reporter Dan Kraker joined host Tom Weber to discuss the treaty rights issues — and history — at play. Understanding the history, Kraker said, helps understand why members of Standing Rock and other tribes have decided to take a stand against this pipeline, at this moment. What's next for Standing Rock — and pipelines beyond? One month from now, President-elect Donald Trump will take office. There's consensus among pipeline supporters and opponents that Trump's administration could give the company the final green light it needs to finish the Dakota Access pipeline. 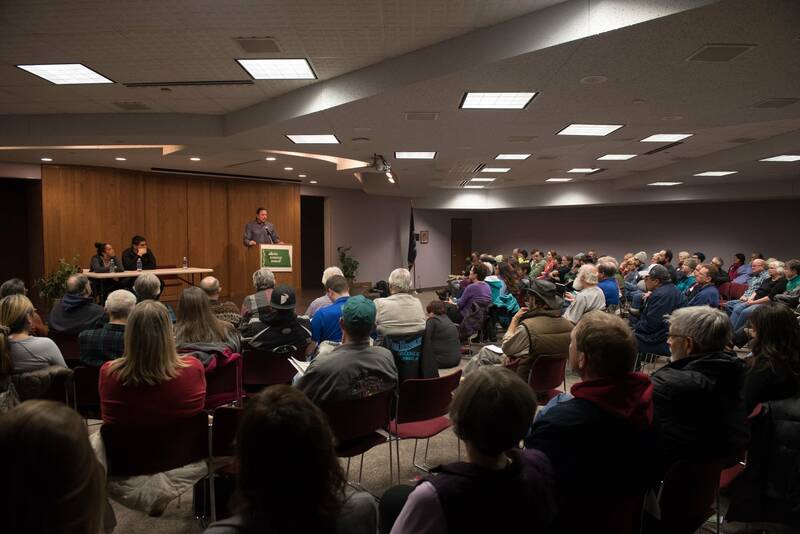 There are a number of possibilities for what might be next, MPR News reporter Elizabeth Dunbar told host Tom Weber, but at this point a U.S. Army Corps of Engineers official has said that more review is needed before granting the easement that's required for the pipeline to go forward. • Related: With Dakota Access pipeline halted, what happens now? The new administration could decide there's been enough review and tell the company to go ahead and finish the pipeline. But the president and his administration would have to give reasons for coming to that conclusion — it can't just be arbitrary. The case is also raising big questions about the overall routing process for pipelines. One of the arguments pipeline supporters are making is that this pipeline often follows existing pipeline or transmission line routes. But pipeline opponents generally don't buy that argument. Standing Rock wants this pipeline out of its treaty area, so rerouting it in that way would be a massive undertaking and would cost hundreds of millions of dollars.